I love being able to share resources with you that will truly ENHANCE the lives of your children. 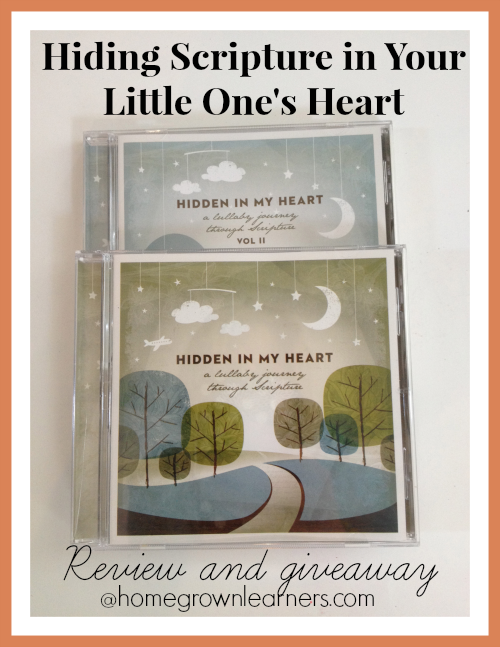 Several months ago I found out about Hidden in My Heart, scripture lullabies, and even though I don't have "babies" anymore, we have all been enjoying this music. It has been playing throughout our school day, when the kids are getting ready for bed at night, and in the car. I love the little "lightbulb" looks they give me when they so clearly know the scripture that is embedded in each song. *I have been given this product to review and am also receiving financial compensation. I'm a tough music critic, and wouldn't endorse this product unless I LOVED it. These CDs get two thumbs up from me! Produced by Breakaway Music, each CD saturates its listeners in God's word. In fact, Breakaway Music "wants kids to have a relationship with Jesus." Hidden in My Heart, Volume 1 consists of 12 songs. Each song is scriptural and peaceful. You can listen to a little of each lullaby ~ I know you will love them! Hidden in My Heart, Volume 2 also consists of 12 songs. You are also able to preview these songs as well. Download a free song by clicking the "Free Lullabies" tab at the top. If you couldn't already tell, this is one of my favorite music resources! These recordings have such a peaceful, calming effect on my home, not to mention the scriptural basis for each song. The voices used on the recordings are pleasant and some of the best I've heard in children's music. So often, children's music can sound "canned", but Scripture Lullabies are authentic and the instrumentation is beautiful. Each lullaby is firmly rooted in scripture, so it gives your children an opportunity to hide God's word in their hearts. It also brings God's word to children in a way that speaks to them best - through MUSIC. I have purchased a set of these CDs to give as a baby gift to a friend of ours who is expecting, and this will become my standard baby gift for some time to come! You can purchase the physical CDs of Volume 1 and Volume 2 each for $13.95. The .mp3 downloads are available for $9.95 each. I also like that you have the option of purchasing the Instrumental or Accompaniment tracks for $9.99 each, too. *If you use the code SLPROMO13 you will receive a 15% discount. This offer expires 12/31/13. One lucky winner will receive Volume 1 and 2! Please follow the widget instructions for entries. The winner can choose either the physical CDs or digital downloads.